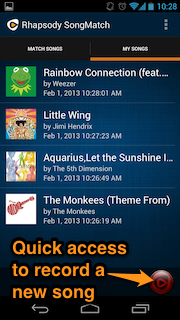 This article refers to an app, Rhapsody SongMatch, which is now integrated into the Rhapsody app. For more information, see Track Match. When you tap the red record button, the app records a short sample of a song playing and then tells you the name of the song and artist. We call this a Match. Try again! If you still can't get a match, try moving closer to the audio source, eliminating any background noises, and make sure you're not at a quiet point in the song. In some rare cases we may unfortunately not be able to tell what song is playing. Matched a song but can't play it? Most likely we don't have the rights to that particular track. In this case, you'll see some suggested tracks that are similar and are available on Rhapsody. 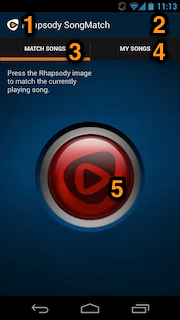 Remember, you need an active Rhapsody subscription to play a full song. 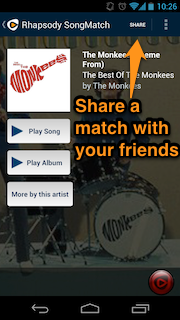 Anyone can use Rhapsody SongMatch, whether you're a Rhapsody subscriber or not. Rhapsody subscribers get the awesome benefit of easily playing back the entire song and having it automatcially added to a playlist available wherever they use Rhapsody. 2) The widget will also show the Last matched track. If you haven't made any matches yet, you'll see the Rhapsody logo.